Plaid is great, but argyle nursery decor and baby bedding may be even better! 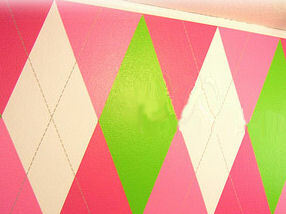 There is just so much that can be done with this unique pattern on the walls, floors and last but not least, the possibilities for stylish color schemes using argyle patterns. I can imagine any number of popular color schemes that would lend themselves beautifully to an argyle design in both boys’ and girls’ nurseries. 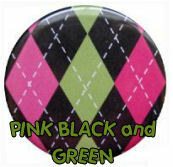 For girls, pink and black diamonds with the traditional argyle "stitch" in an X shape in white would make a superb background for a Parisian baby room. For boys, a blue and green argyle baby bedding set would kick off a golf theme argyle nursery cute enough to make dear old dad miss his tee time. This pattern may not be everyone's taste, but to dismiss this classic design as old fashioned would be a tragic mistake. One of these days maybe, just maybe, I will find the perfect opportunity to decorate a vintage argyle baby nursery theme for a little boy using my cache of vintage golf clubs that are gathering dust in my closet. 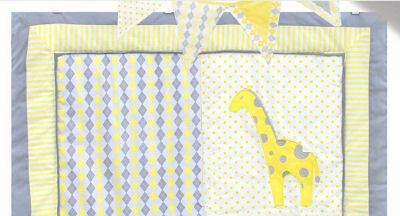 Go here to see the rest of the collection that matches the argyle crib quilt with the giraffe applique. 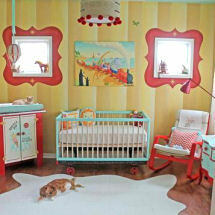 As this elegant nursery for a baby girl proves; argyle is not a pattern reserved for baby boys. The hot pink walls accented with a bold black and white painting technique accented with faux jewels is as feminine as can be. In my opinion, there are two choices in argyle nursery design. The first choice (and the least time consuming) would be to let the argyle baby bedding set enjoy center stage and choose your decorations to complement it rather than to compete. My second choice, which is by no means the simplest, is to paint an argyle pattern on the nursery walls using colors that will work well with your preferred crib bedding. If you have a very large nursery you may be able to use both. But the nursery floor plan that could pull this off is rare. 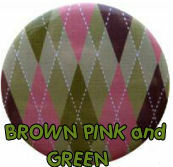 There are several color combinations that I have used to decorate an argyle baby nursery. Dress a teddy bear in a cute argyle sweater and hat or paint a similar pattern on a lamp shade that you used on the nursery wall to give your nursery design a balanced appearance. If your baby's nursery floors are in less than perfect shape, consider painting your argyle designs on the floor in lieu of an area rug rather than using it to decorate the walls. Return to Unique Baby Gear Ideas to find more baby nursery ideas and to see many baby nursery themes where argyle would be a great fit.